I arrived at Frankfurt airport on the 7th September and took a train to Kaiserslautern where I was met by Amela from IPB and the organising team. After booking in to the hotel I went along to visit the peace camp site and met up with Konni who had visitied us in Yorkshire for Keep Space for Peace Week last year. 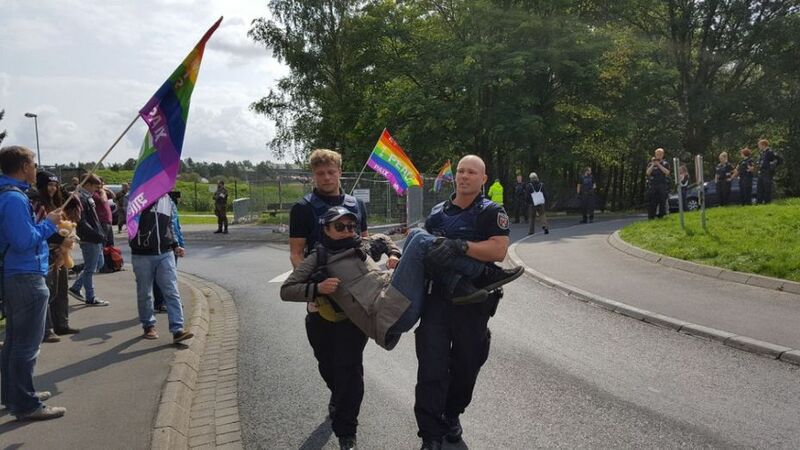 I was also told about a visit to Büchel Air Base the next day with the group "Atomwaffenfrei jetzt" (Nuclear Weapons Free Now) to blockade the entrance. 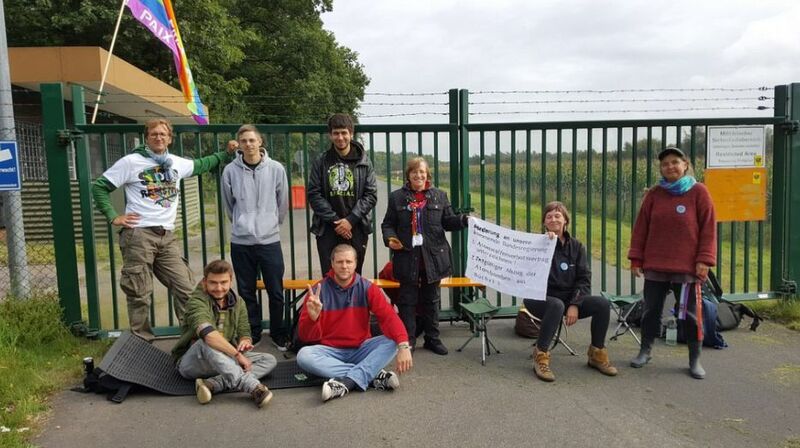 So I signed up for that and the next day a coach full of protestors left the peace camp earlyish for the 2 hour journey to Büchel. 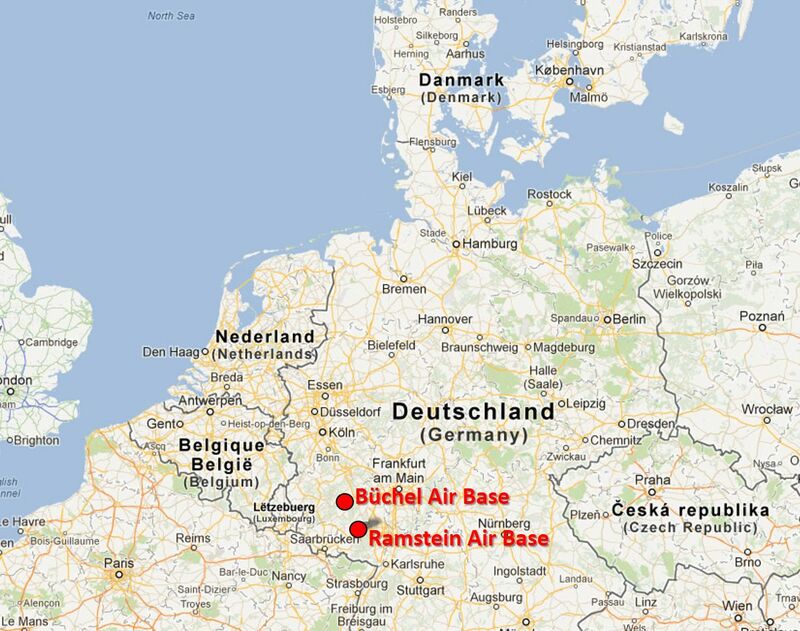 Büchel is the military air base near the city of Cochem and about 45 miles from Spangdahlem Air Base. It is now the only location in Germany with US/NATO nuclear weapons. Büchel is home to the Tactical Air Force Wing 33 (TaktLwG 33) of the German Air Force and the 702 Munitions Support Squadron (702 MUNSS) of the United States Air Force (USAF). Since 1985, the TaktLwG 33 operates German Panavia Tornado airplanes, which are capable of delivering the twenty B61 nuclear bombs, which are stored and maintained by the 702 MUNSS of the USAF. Under the NATO agreement, these B61 bombs require a dual key system, with the simultaneous authorization of Germany and the US. On arrival, the police took videos and then examined the ID of everyone who was there, blockaders and observers. We were all photographed and our details were taken down. We were told that if we could be identified from their videos as taking part in the actual blockade we might hear more from them. However, if we were not then the personal details that they took would be destroyed (so we were told) and we would hear nothing more. 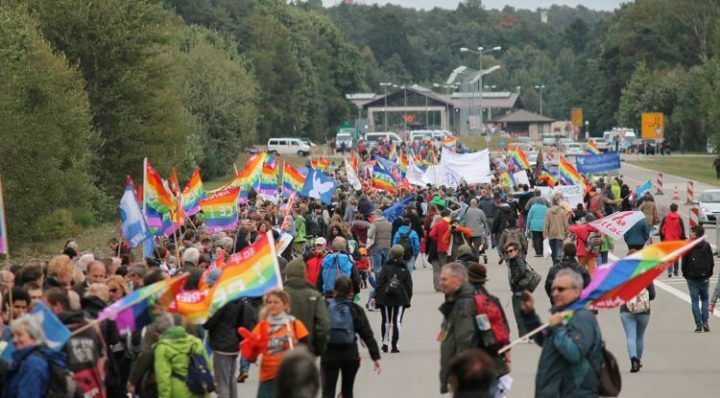 The following day, Saturday 9th September, over 5,000 people gathered at the Ramstein US Air Force Base near Kaiserslautern in Germany for the climax of a week-long protest. The base has some 22,000 US military and defence personnel and, with family members, the number increases to 54,000, making it the largest concentration of US citizens outside of the US. 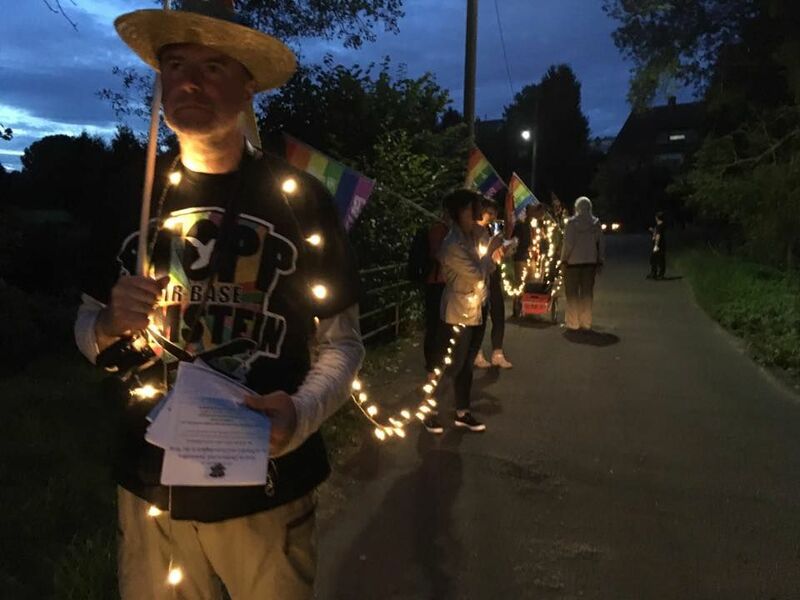 A peace camp had been building in numbers over the previous few days and on one evening campers had walked into town connected by a string of LED lights to let local people they were there - and why. Many of the protestors also marched against the Vietnam War in the 60s and 70s and the Pershing-2 nuclear missiles in the 80s but there was also a large, growing number of people too young to have experienced those times. 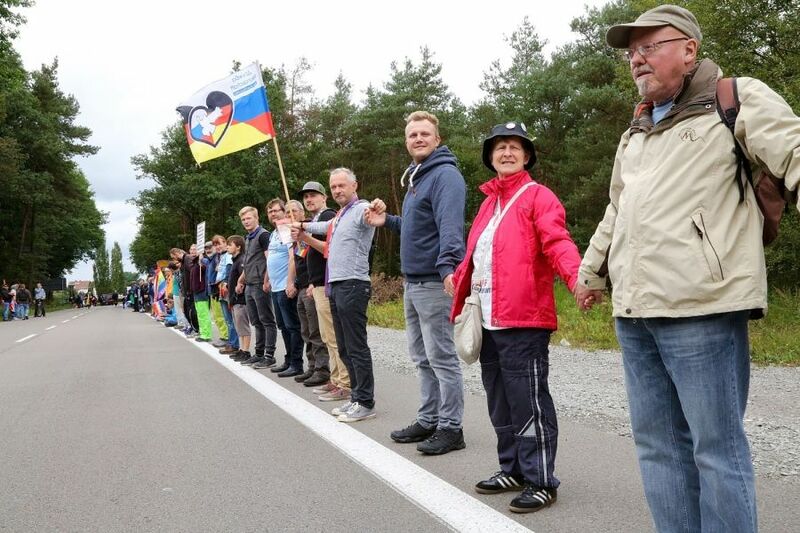 Protestors formed a human line which stretched for 5 kilometers between the Air Base, Ramstein and the monument erected in memory of the air show disaster in 1988 when Italian Air Force display team aircraft collided during a display, crashing into the crowd of about 300,000 people. There were 70 fatalities (67 spectators and 3 pilots); 346 spectators sustained serious injuries in the resulting explosion and fire, and hundreds more had minor injuries. At the time it was the deadliest air show accident. 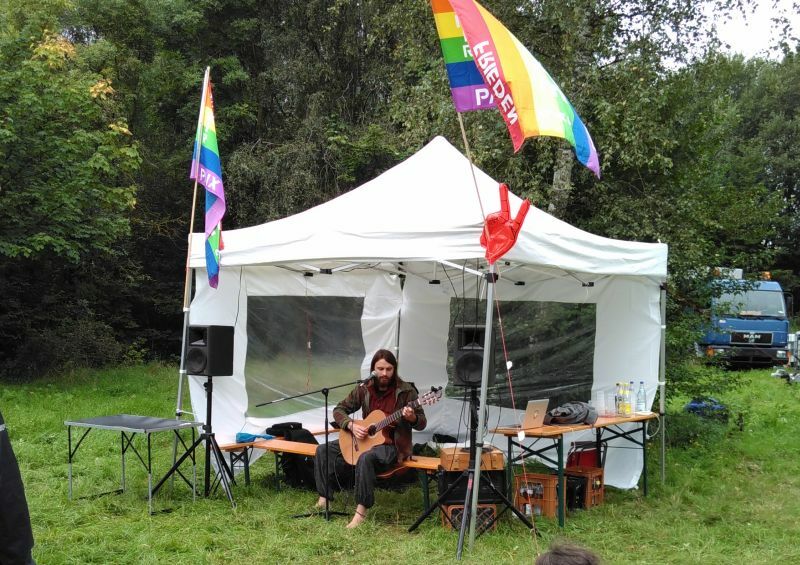 After Pascal Luig, member of the coordination group, declared the chain complete and then closed, protestors gathered around two platforms from which they were addressed by speakers and entertained by musicians. At the gathering near the memorial for the victims of the airplane crash flight disaster) the event was moderated by Reiner Braun (co-president of IPB) and Gunda Weidmuller (Hamburg Forum for International Understadning and Global Disarmament). The speakers included: Anne Rieger (Caveats Peace Advice); Otto Jäckel (IALANA); Erika Erdmann (Women Dare Peace); Wolfgang Kramer (Pax Christi); Smooth Bottom (DIDF); Andreas Hartenfels (Bündnis 90 / Die Grünen); Alexander Ulrich (MDB, Die Linke). There was music from Diether Dehm and Bermooda. 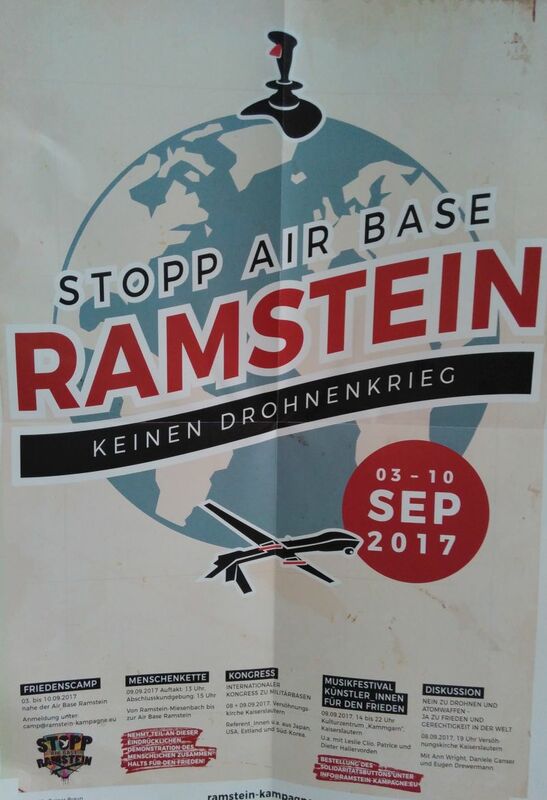 Nearer the Ramstein Air Base, another platform included speeches by Oskar Lafontaine (Die Linke); Silke Hollenbach, kuhle belly; Michael Müller (Former State Secretary of State) Tabea Rößner (Bündnis 90 / Die Grünen); introduced by Reiner Braun. 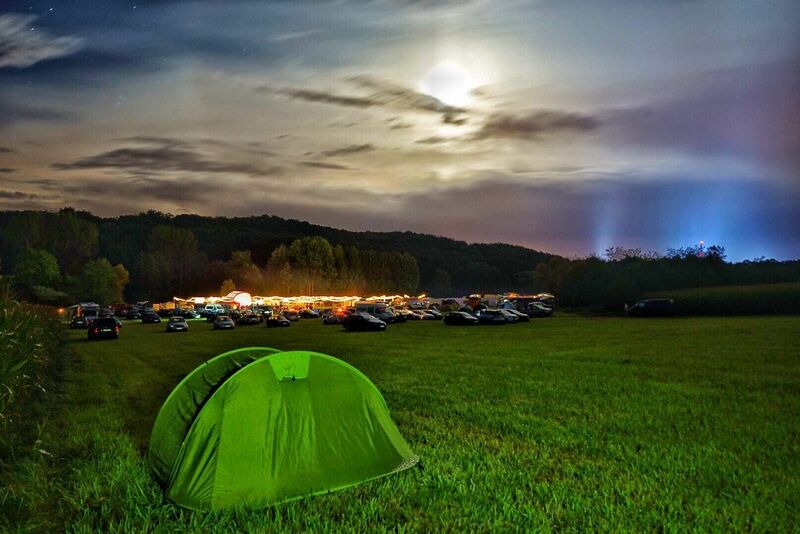 Unfortunately, a downpour of rain brought a premature end to the event! 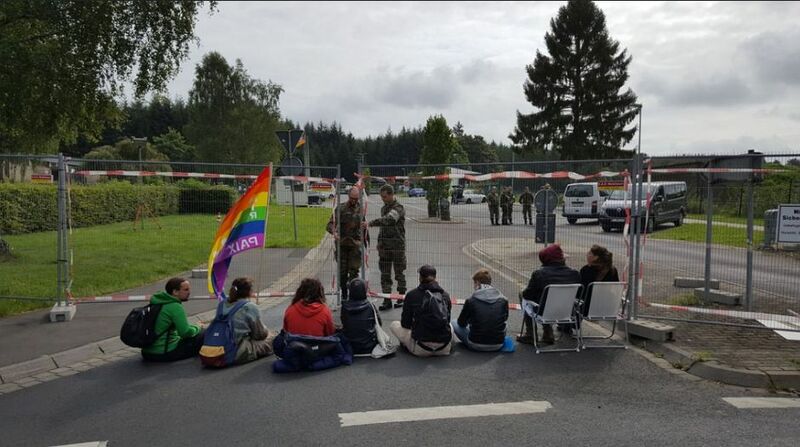 It was the third week long Stop Air Base Ramstein protest in three years. 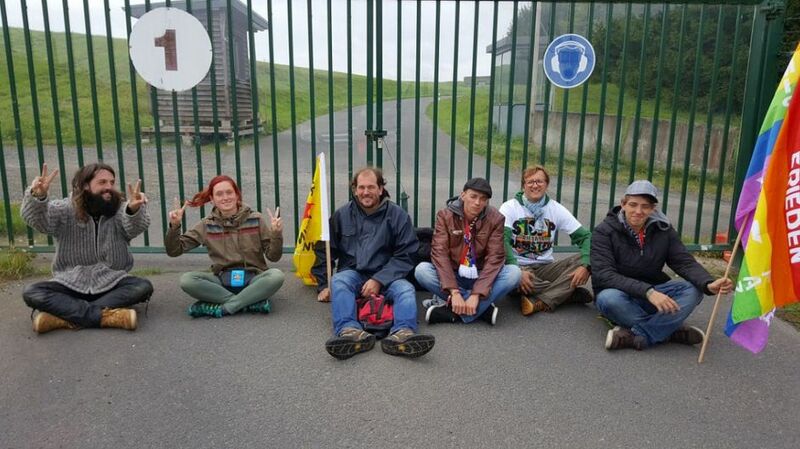 The police kept the peaceful demonstrators from being too close to the base entrance. As Reiner Braun explained in his speech of introduction tough negotiations enabled them to be at least 100 meters closer than last year and "we stalk at the base until we stand in front of the base. Then we have to go to the base and finally she has to leave, " he said to great applause. 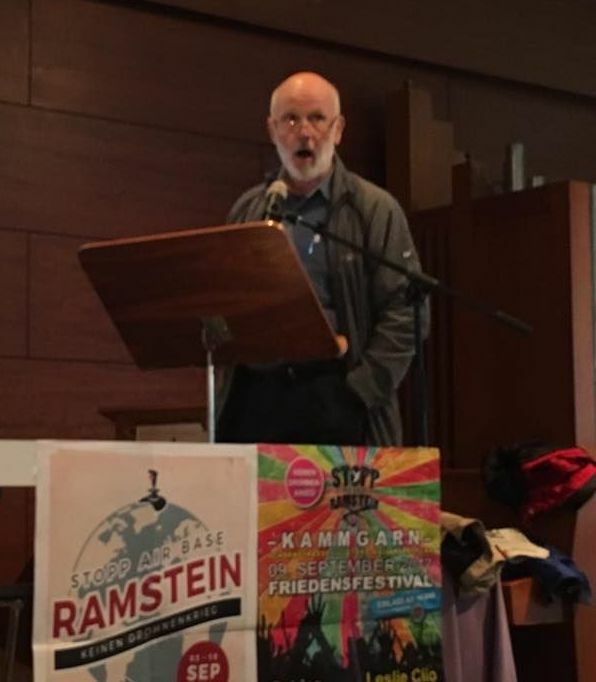 Oskar Lafontaine from Die Linke referred to the economic foundations of the current wars "capitalism carries the war in itself like cloud the rain" he said. 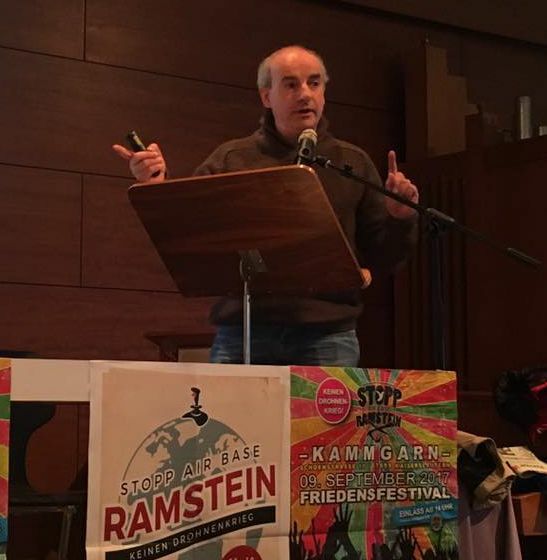 Michael Müller, chair of Naturefriends and former Social Democratic Secretary of State at the Ministry of Environment added that "we need a greater and more actionable peace movement against the immense rearmament of NATO". The protest is growing stronger and louder every year and is always positive. The growing number of young participants also shows that the necessary rejuvenation of the peace movement is actually in full swing. 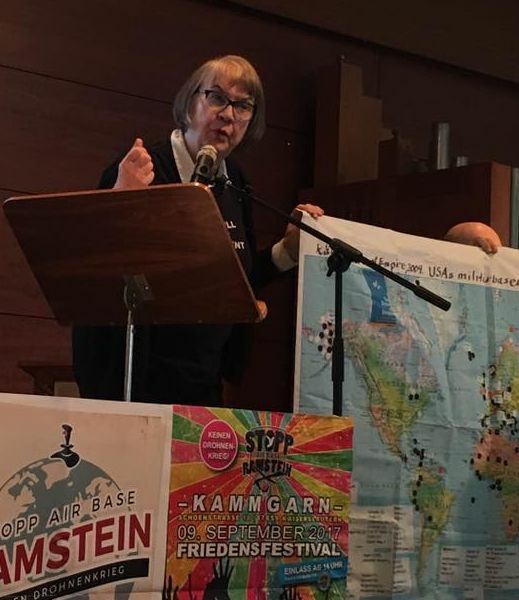 As Connie Burkart-Schmitz, spokeswoman of the peace initiative, said, "we are continuing and are coming again in 2018 - huge and non-violent"
Why were they all there at Ramstein? Well, as well as having a role in the extrajudicial killing of several thousand suspects on foreign soil and being the HQ for the US and NATO missile defence system in Europe, which is causing much concern to Russia, it is also a major communications base through which the CIA controls its remotely piloted drone bombardment in Africa and the Middle East. In doing so, the US is violating international law and German constitutional law. 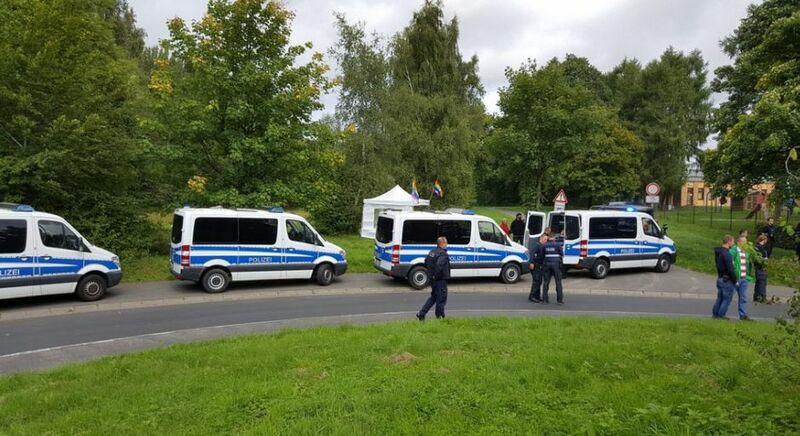 The German government claims that no drones are being flown from Ramstein – however, although the drones are not flown from there, it is a major hub for relaying the signals and commands from the pilots in the US. 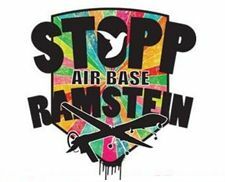 However, the former drone pilot turned whistleblower Brandon Bryant (who flew more than 1,000 operations from the US), has revealed how much the US global drone operations depend upon Ramstein. 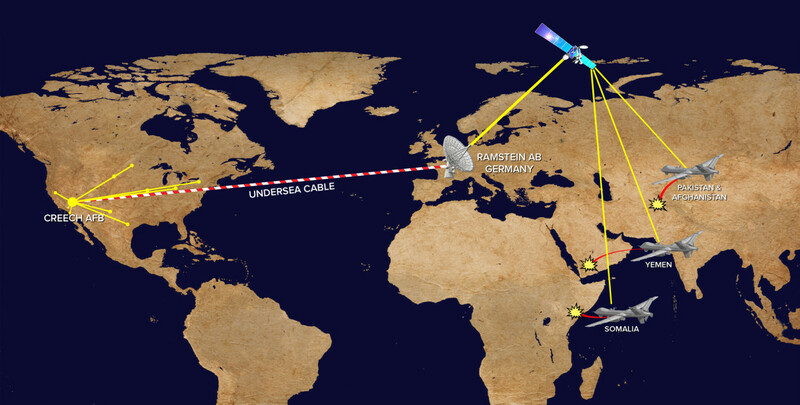 He described how signals sent from Creech Air Force Base in Nevada travel via transatlantic fibre optic cables to Ramstein, where they are then transmitted to satellites positioned above the Indian Ocean and from there to drones that strike targets in Africa, the Middle East and Central Asia. In addition, live pictures taken from the drone operations are analysed in Germany. An International Congress was held on September 8th and 9th in the Versohnungskirche in Kaiserslautern had over 300 participants. 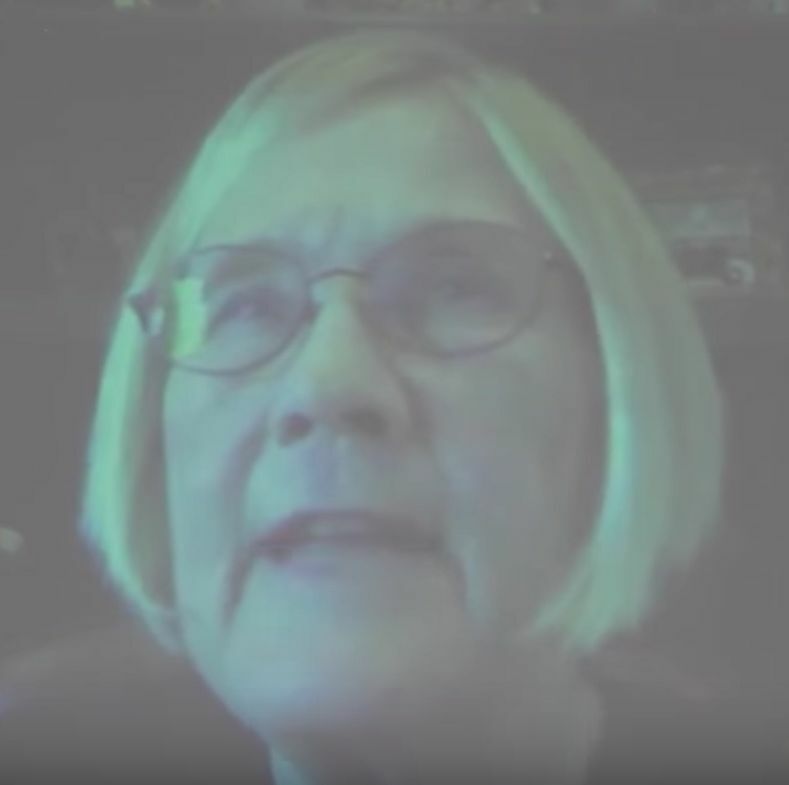 As well as many knowledgeable speakers from Germany, there was a video from Ann Wright, the former US Army Colonel and diplomat who resigned over the Gulf War and became a wonderful peace activist. 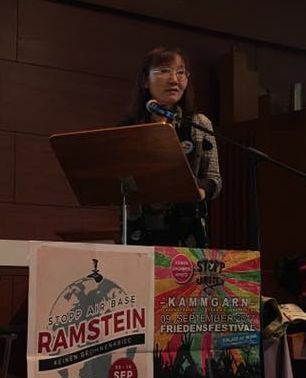 There were also reports from campaigns focussed on US bases around the world - Ikuko Ueno from the Okinawa Nago City Peace Committee; Okinawa; Hohyun Choi from South Korea People’s United Party; John Lannon from Shannon Watch in Ireland; Kirill Kopp from Estonia; fellow GN board member Agneta Norberg from Sweden and I spoke about US/NATO bases and military exercises in our countries. I was also able to mention the various UK military bases around the world as well! There were also workshops and plenty of time for discussion and meeting others. On the evening of the 8th there was also a public meeting at the Versohnungskirche with a message from Ann Wright and some incredible speeches from Eugen Drewermann and Dr. Daniele Ganser. Ann was due to be there at the event but she was helping members of her family recover from the recent hurricane that had devastated much of the eastern coast of the U.S. So instead, she appeared by live video link. Unfortunately I was separated from our translator who had helped so much in the conference earlier that day, so was not able to understand most of what was said by the German speakers. 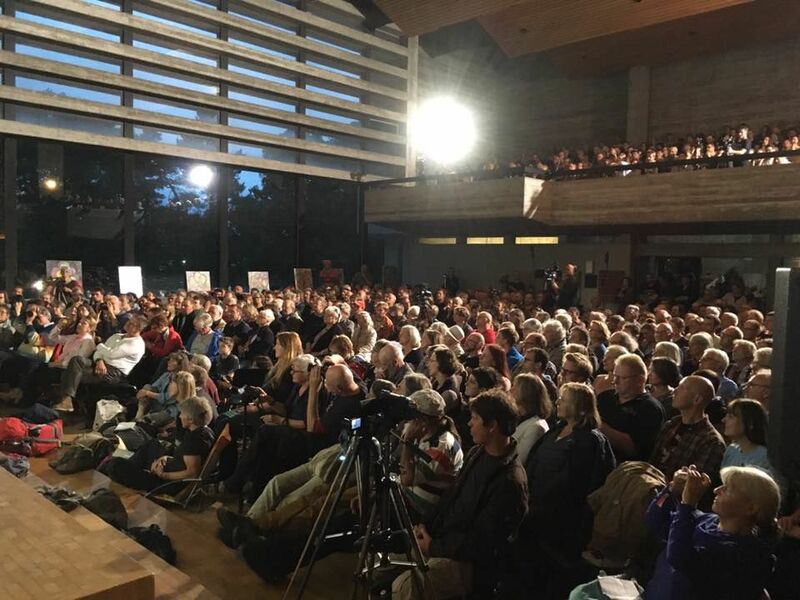 However, the reaction of the packed audience, who were either laughing loudly or widely applauding and gave standing ovations to both, told me quite plainly that they were saying things that resonated strongly with those present! Over 1000 people came to the public meeting - the huge auditorium was packed, as was another hall downstairs which was showing a video relay! 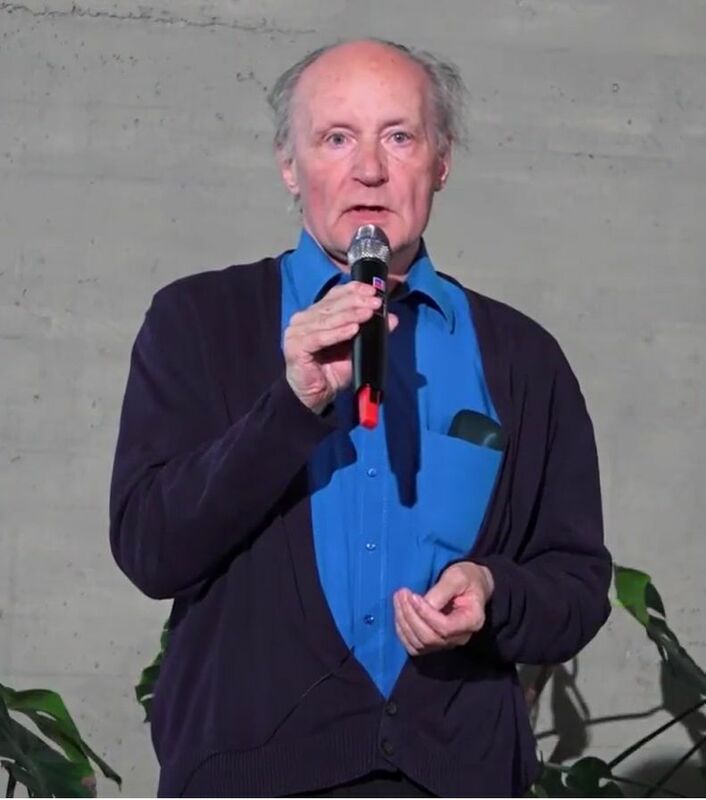 Eugen Drewermann is a German church critic, theologian, peace activist and former Roman Catholic priest who left the Catholic Church on his 65th birthday on 20 June 2005. Drewermann is best known in Germany for his work toward a non-violent form of Christianity. He was against the Gulf War, the Iraq War, German participation in the NATO war against Afghanistan, and Israeli Air Raids during the 2006 Lebanon War. In the name of the German Peace Movement, he asked to abolish not only Walter Mixa's office as Military Bishop of Germany but the German military, the Bundeswehr, as such. 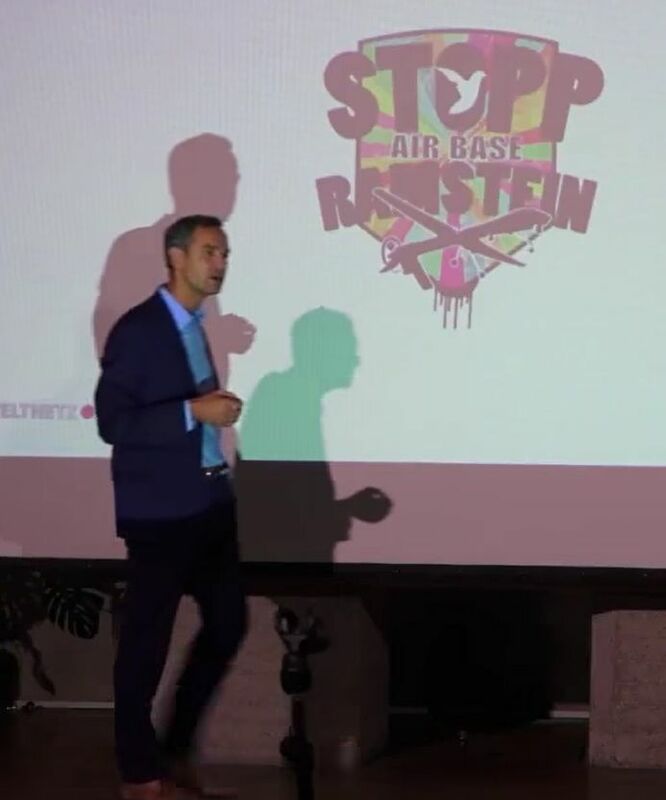 Dr. Daniele Ganser is a Swiss historian and his book NATO's Secret Armies (2004) describes the secret armies run by NATO and in particular, how Operation Gladio units worked in close cooperation with NATO and how Gladio was responsible for terrorist attacks against the Italian civilian population. Ganser has also contends that the real reason for the Gulf War and subsequent military actions was not against terrorism but to gain control of energy resources. He calls into question the conclusions of the 9/11 Commission. He believes that "the official story about September 11th, the conclusions of the commission, are not credible." and "The information that we have is not very precise. Which raises the question in this report of 600 pages is that the third tower that collapsed that day is not even mentioned" and he calls for a new investigation. Reiner Braun mentioend afterwards how many of those who came along were not the usual crowd of supporters but had come to find out more - which I am sure they did. 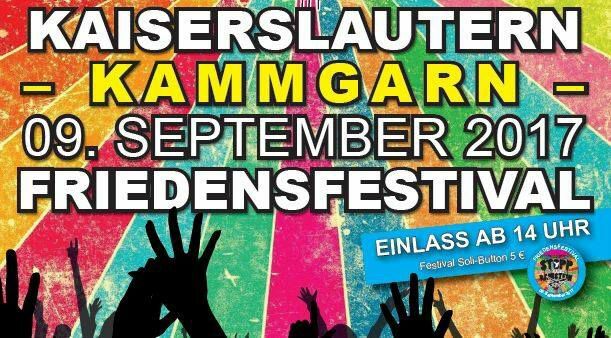 On the 9th during the Friedensfestival, a wonderful music festival that was organised as a grand finale (with three stages and a wide range of music) a preliminary meeting was held as a first step to establishing a global campaign against military bases. This will be more firmly developed in the next few months. Thanks to the fantastic team of Reiner Braun's that organised the few days of protest and festival. Led by Pascal Luig the handful of helpers worked incredibly hard to get us all in the right place at the right time. Tremendous organisation and planning - thanks so much. 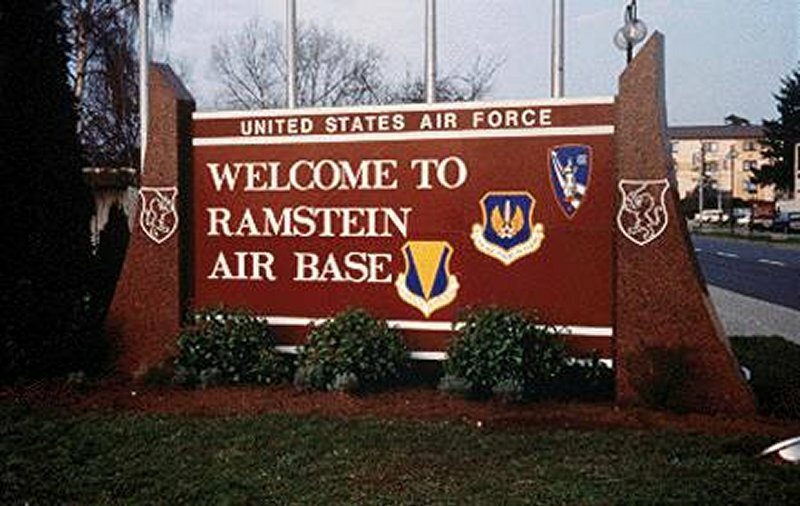 Ramstein is part of a global US military intelligence network that includes, among many others, the bases at Menwith Hill, near Harrogate, and Croughton, near Oxford. The Menwith Hill NSA spy base stands accused of supplying information, gathered through the interception of electronic signals, used for the targeting of US and UK drone strikes. A new "Joint Intelligence Analysis Complex", now being constructed at Croughton, will put the USAF base at the heart of a web of military and intelligence networks stretching from the USA to Europe, North Africa and the Middle East. 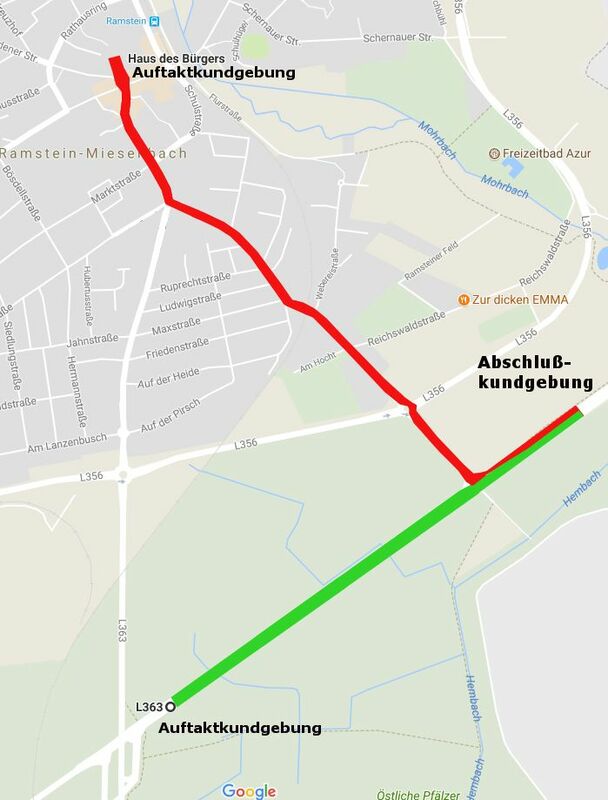 In November 2013, The Independent identified Croughton as a "relay centre for CIA clandestine and agent communications" – which was used to ferry the intercepted data from Chancellor Merkel's mobile phone back to the US. It also appears to be used to communicate, via a specially laid fibre optic cable, with the US forward operating base in Djibouti which co-ordinates drone strikes over Yemen. There will be protests held at Croughton (7th October) and Menwith Hill (10th October 6-8pm) as part of the annual global campaign “Keep Space for Peace Week” – see: www.space4peace.org. 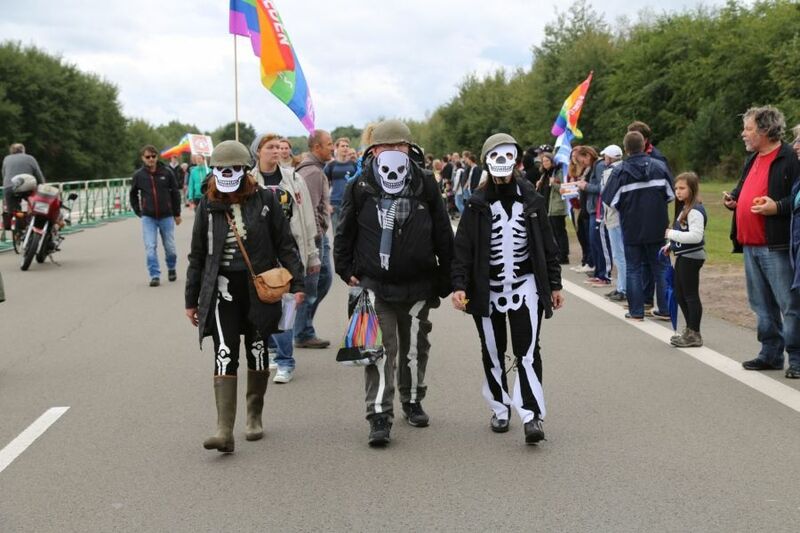 Join us – help build the protest to military bases in the UK and around the world.